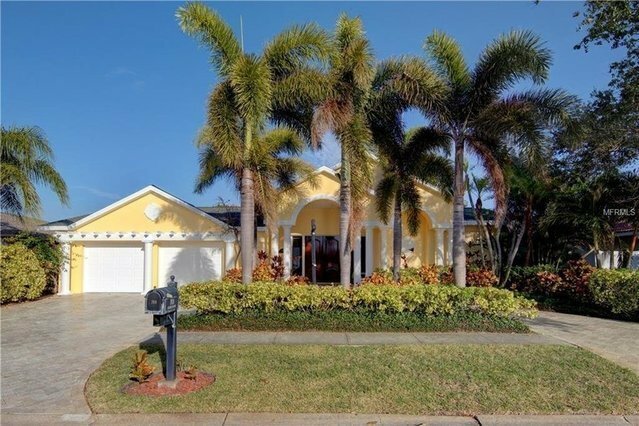 Expansive Clearwater Harbor views that stretch from Clearwater to Dunedin are featured in this remodeled waterfront home located in Island Estates. The dock includes a new boat lift for your boating needs. An airy living room with volume ceiling and an open family room with fireplace and stone accent wall both overlook the open water views and sparkling pool. This cheery multilevel floorplan provides style and character. The updated white kitchen offers granite counters, breakfast bar, island glass cooktop, double ovens, pantry cabinets, cookbook shelves and built-in computer desk. The open dining area features a large walk-in wet bar with counter seating, built-in bookshelves and French doors to the pool. The spacious master bedroom offers a stone faced fireplace, French doors to the pool, plantation shutters, built-in drawers and bookshelves, triple closets and a private bath with walk-in shower. Two bedrooms share an updated hall bath with tub/shower. Other features include a third bath off the family living area, laundry room, bonus room (art studio) overlooking the water, and a large covered lanai area for relaxation and cookouts. The paver circular drive provides lots of parking. Island Estates features a new Publix grocery, shops and restaurants, and you are only minutes from Clearwater Beach attractions and yacht clubs.